Trepidation is often defined as a worry or fear of what is going to happen. 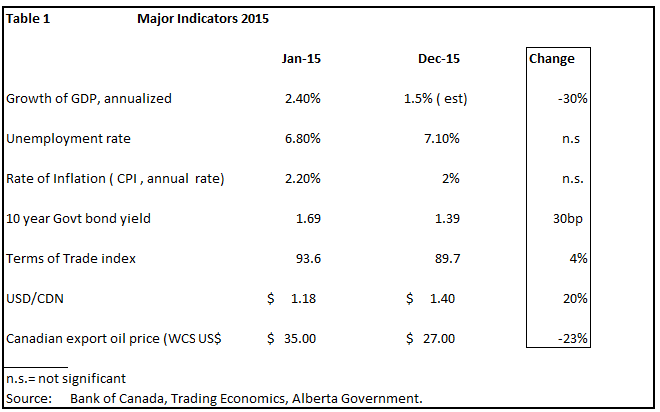 This best describes the feeling many Canadian investors have regarding the economic outlook for 2016. It all started with the dramatic collapse of world oil prices in 2014, the continued decline through 2015 and then into January 2016. To get a better appreciation of why there is growing concern for 2016, let us review the basic developments of 2015 and how they may impact on developments in 2016. Table 1 identifies some of the key economic developments of 2015 that are now weighing on our minds as we launch into 2016. * Unemployment. The unemployment rate crept up during 2015 from 6.8% to 7.1%. More significantly, the quality of job creation leaves a lot to be desired. In December, for example, the economy created 23,000 additional jobs; however there was a loss of 17,000 full time paying jobs against a gain of 40,000 self-employed workers. *Inflation. The rate of price increases slowed considerably, largely in reaction to the fall in gasoline prices. This is a mixed blessing for a country that relies so heavily on oil exports. *Terms of Trade. The prices we receive for our exports have fallen relative to the prices of imports, resulting in a decline in national income. The Bank of Canada estimates that the decline in the terms of trade has resulted in a loss of $50 billion a year or $1,500 per person per year. * Oil Prices. The continued slide in oil prices has had a dramatic effect on capital investment, especially in the Oil Patch. This has resulted in significant job losses in western Canada which continue to this day. The industry mantra regarding prices is ``lower and longer``; the question is how much lower will prices fall and for how much longer. Already January's price decline of 10% is roiling the financial markets everywhere. * Canadian Dollar. In the wake of the strong upward movement of the USD, the CDN has fallen sharply over the year, forcing Canadians to make unwanted adjustments in the purchase of imported goods (especially food) and in international travel. Consumer confidence has been hurt by the dollar's almost free fall. Essentially, the drop in oil prices is now reverberating throughout the whole country. As the Governor recently admitted, "the forces that have been set in motion simply must work themselves out"(1). It is no wonder that the mood in Canada is subdued and there continues to be a feeling that we are powerless in dealing, in the short run, with a deteriorating economic situation. The Canadian stock exchange, the TSX60 is heavily weighted in energy and bank stocks. The resultant 12% decline in 2015 was one of the largest in recent memory. This trend continues in the first week of January 2016 when the index fell another 7%, adding to investors' woes. Recently, a Bank of Canada survey of business conditions, revealed that business respondents predicted a further decline in investment plans for 2016. The commodity bust is now starting to seep into other sectors of the economy. With deflationary forces well entrenched, short and long term interest rates fell significantly during 2015. The Bank of Canada lowered its rate twice, dropping the overnight rate from 1% to 0.5% in response to the deteriorating domestic economic conditions. Housing was the only bright spot in 2015. 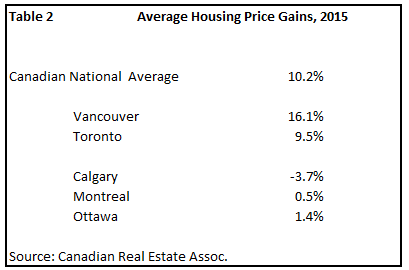 Nationally, the average home price increased by 10%; although the market was heavily skewed to the very lofty prices in Vancouver and Toronto, the rest of Canada experienced modest price increases ( Table 2). In a recent speech, the Governor of the Bank of Canada, adopted a 'made -in-Canada' monetary policy. This policy diverges from that of the US where the Federal Reserve is on track to raise short term rates over the course of the next 12-18 months. The Governor stated "we will continue to conduct an independent monetary policy in response to our own economic circumstances in order to meet our 2 percent inflation target"(1). He cited a range of conventional and unconventional tools that are available to promote growth. In fact, many analysts expect the Bank to lower its rate later this year in effort to boost growth, further entrenching the theme of divergence in monetary policy. 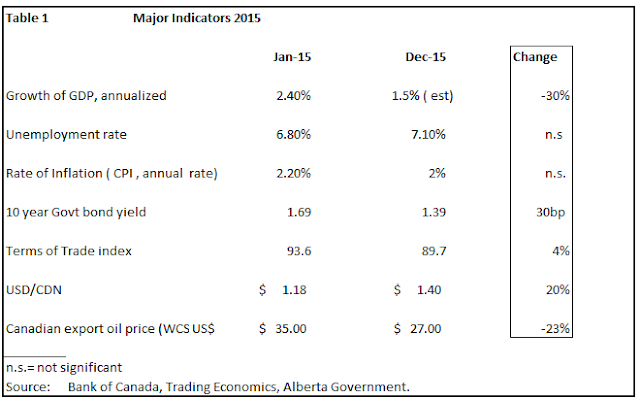 Benjamin Tal of the CIBC claims: "It's becoming very obvious that monetary policy is not the solution. The Governor admitted that a low currency is our only hope but the benefit of cutting rates in order to get another cent or two out of the dollar fades relative to the damaging impact on household leverage" (2). In other words, there is a concern that dropping short term rates will only fuel the housing market-- a market that some consider to be overheated considering household debt levels. This brings us to the most controversial aspect of the Canadian environment: will housing prices finally crack under the weight of a deteriorating economy? There are many ways to measure the vulnerability of housing prices to household leverage. For American readers this topic also resonates, having endured one of the largest housing collapses in modern history starting in 2007. 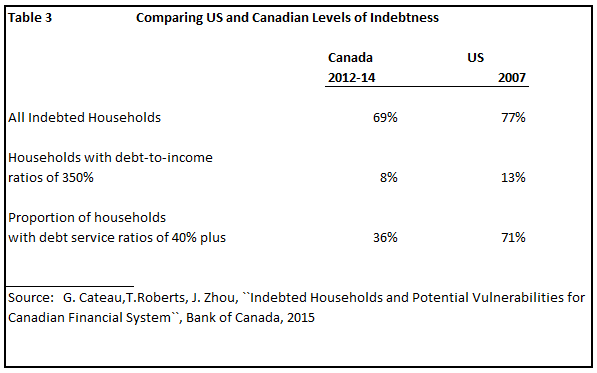 In a recent study by the staff of the Bank of Canada, summarized in Table 3, debt ratios are compared between Canada in 2012/4 with those in the U.S. in 2007. Canadians are not nearly indebted today as the Americans were in 2007. For example, Canadian households with debt service ratios of 40% plus (a major threshold level) comprise only 36% of all household, compared to 71% of US households in 2007. Given the limitations on monetary policy, we have to look to fiscal policy to improve the economic climate. The Federal Government will introduce a budget in February which is expected to feature infrastructure spending across the nation. The remaining hope is for a stimulus package. Meanwhile, Canadians continue to feel a degree of vulnerability. We start the new year with considerable unease.